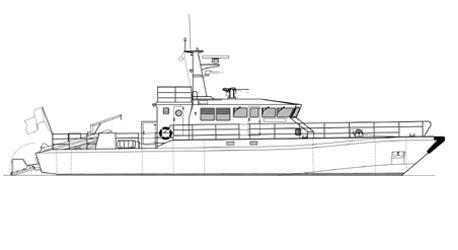 Dockstavarvet has made completely new design on a Coast Guard vessel that is 25 meter in length. The boat has entirely new design, all in welded aluminum to a very high technical standard. The boat is fitted with 2 x 808 kW engines and water jet propulsion for a top speed of 25 knots. The boat also has a smaller engine on 360 kW for low speed. The LOA is 26.30 m, the beam 5.00 m and with a displacement of 55 tons. Accommodation is laid out for a crew of eight. Modified versions with additional crew facilities are available.